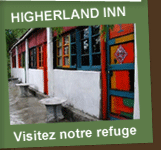 A hostel/guesthouse located 2700 metres above sea level in the CangShan (苍山) mountains, an hour and a half hike from Dali’s old town, the Higherland Inn is the ideal base for innumerable treks in Dali county in the northern half of Yunnan Province. A five-hour bus ride from the provincial capital of KunMing (昆明) and three hours from the famous town of LiJiang (丽江), Dali’s old town is a perfect launch point for countless excursions. For these reasons, as well as for the wonderful people at the Higherland Inn, Amiwa has set up a portion of its offices at the Inn. The CangShan mountains (with their summit, the MaLong, which towers 4122 metres), ErHai Lake (fourth largest fresh water reserve in China), and the town of Dali with its traditions of travellers and trekkers have seduced, without exception, each of Amiwa’s own hikers, as well as those that have been counselled by both the agency and the inn alike up through the present day. The area is particularly rich in flora and fauna (several dozen native species of plants grow in the CangShan and more than half of all China’s native plants and animals can be found in Yunnan Province) that will appeal to botanists and nature-lovers alike. Various paths (some of which are signposted) around the Inn provide the opportunity for starburst-style treks of a few hours up to several days. On a longer trek, you can also stop over at the Inn along your route to rest before heading off again with renewed vigour. Beyond its geographic assets, the Higherland Inn is a haven of calm and the ideal place to meditate or practice yoga, taijiquan (taichi), qigong, calligraphy or any other creative activity. They offer regular classes and there is a studio available for guests seeking calm and inspiration. Cultural exchange is a daily affair at the Higherland! Food lovers will never regret a stay at the Higherland, where Chinese, Bai and French chefs round out a solid menu of "western food". It is a point of honour for the inn that it serves up healthy and varied dishes for its guests. Some of the vegetables that you will find on the inn’s table even come straight from its own garden. Cheap, oily Chinese food is nowhere to be found and vegetarians will especially relish the great variety of satisfying options on the menu. Guests are also invited, should they so desire, to enrich the inn’s familial dinners with their own culinary specialities. Menus designed specifically for hikers passing through are also available. And, finally, the Higherland team and its partners are always willing to help you prepare for your next adventure and can assist with hotel reservations and train/bus/airline tickets, as well as answer any other logistical question you may have.